When we visited Joshua Tree National Park last year, we actually got a little bit of rain. And I mean a very little bit. It was a brief respite though from the very dry last five years that California has suffered. 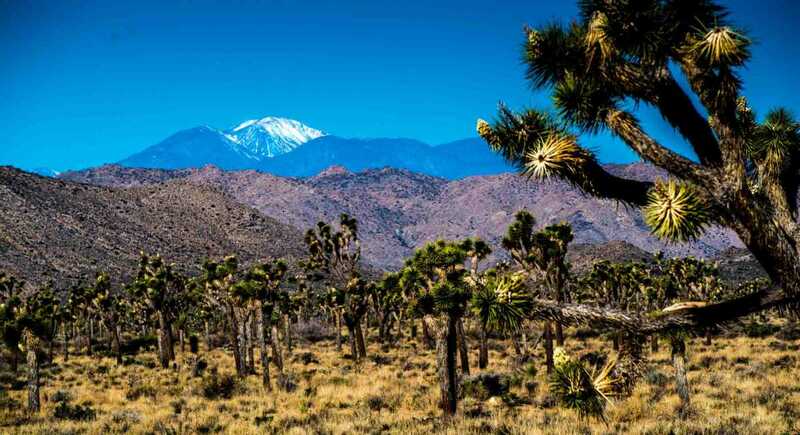 So I was very pleased that as I flew into Los Angeles for this trip, and as I drove around Joshua Tree Park, we were never out of sight of the snow on San Gorgonio Mountain. It certainly wasn’t there last year. So, while California has a long way to go to recover from its five-year drought, its at least a little comforting to know that there’s a chance it won’t be so bad this summer. We could use a summer with fewer fires, and more snow, and the water it brings. I was part of a group of 12 travel bloggers who were kindly hosted by Mazda and James and Heather Hills of Mantripping.com for three days of camping in Joshua Tree and driving around the southern desert of California in really nice Mazda cars. I shot this photo as I was on my way in my borrowed Mazda CX 5 (I love that car) to Palm Springs to shoot some modern architecture (more on that later.) As I said, I wasn’t expecting to see snow in Southern California, but I’m so glad I did. Melodie, we were camping at Sheep Head, so most of our meals were home cooked around the campfire. I did have my first Del Taco bowl however, and it was a cut above the fast food you get in most places. We did stop at the Banana Museum for a banana shake on the way to Salton Sea, but, alas, it was closed. Tell me where Hadley’s is and we’ll put it on the list for our next visit. The BANANA Museum ~ now THIS is remarkable! Imagine the banana shakes would HAVE to be good. Anyway, Hadley’s Fruit Orchards is off the I-10 West, Apache Trail Exit. The current store is brand new ~ looking forward to seeing it ~ but the date shakes remain the same.